I've found that strips of fabric or thick/soft ribbon work best to create this braid. 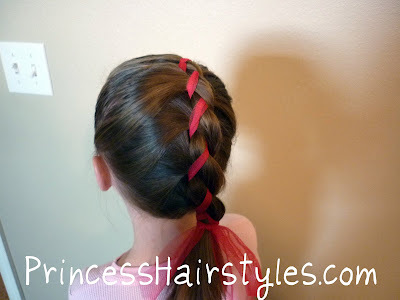 I'm thinking this would be a darling Christmas hairstyle with some red/green ribbons or Christmas fabric. You could even add in some holly or other Christmas decor if you wanted to. sweet. 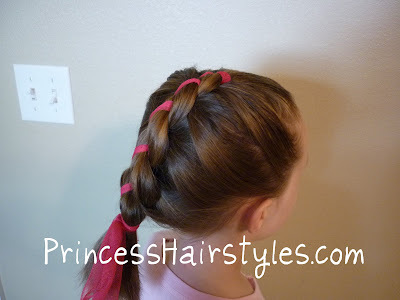 I bet my daughter would let me do this on here hair. How on earth did I miss this site? My Little Zaara has silky long hair and I'm always on the lookout for things to do with her beautiful hair! it's so awesome to do this' and i love it very much'. thanks to your'e blog/website. !